The home theater subwoofer can become a neighborhood noise pollution problem. You’ll know if you get phone calls that interrupt your late night movies. Lawnmowers and leaf blowers may be the scourge of noise pollution during the daytime but late at night, it’s the subwoofer. When building or remodeling a house to include a home theater, some consideration needs to be given to soundproofing. There are two types of soundproofing. One is for the interior of the house, keeping explosive noise from upsetting others in the house. Typically the kids are up late on the weekends showing movies or playing video games and the parents are trying to get some reading done. The second and less considered soundproofing is neighborhood noise pollution. It’s when your system is keeping the neighbors up. You can always turn it down but then, the energy in the movie thins down and the fun of it dwindles. The best time to do soundproofing is during construction. Trying to do it after the house is finished is at least nearly overwhelming and at best, a very expensive and inconvenient remodel project. The best time to do soundproofing is well before you actually need it, during construction. Bass noise levels inside a home theater easily register 85 dB,A and more. 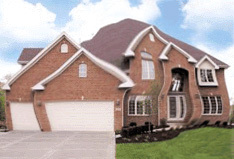 If the home theater is in a concrete basement with no windows and the whole house on top the theater, then there is little noise leaking out into the neighborhood. However if the home theater is in the second story of the wood frame garage add-on then neighborhood noise will likely be a problem. A wood frame house with a subwoofer in a room with exterior walls will leak enough bass through the wall to generate about 70 dB,A at the exterior surface of the house. Stepping back about 5 feet leaves a noise level of about 66 dB,A. Sound drops in intensity 6 dB for every doubling of distance. Of course on the other side of the house it’s much quieter because the house acts as a sound barrier. The following chart shows how loud the bass noise is on either side of the house at various distances. 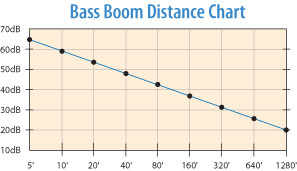 People generally will not want to be hearing the neighbors bass boom at a level more than about 25 dB,A in their bedroom. This means the bass boom of about 30 to 35 dB,A outside is likely tolerable. Clearly neighboring houses that lie within 300 feet of the exterior walls of a room that contains a subwoofer are likely to have a problem with late night movies.